This latest figure set from Bronco is one more that includes a bicycle. I guess this is one of the latest trends. 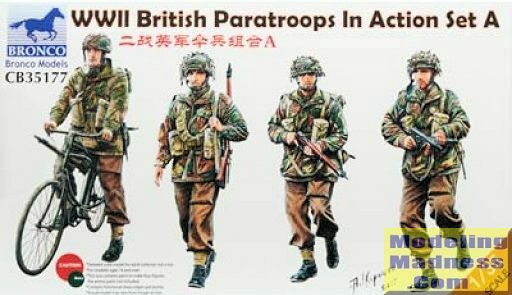 The set has four WWII British paratroopers and one of them is riding a bicycle. All of the soldiers are moving to some degree and the set includes their various weapons and kit. 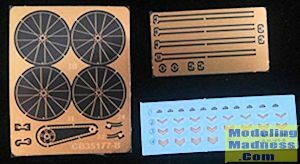 A photo etch fret is included that has things like the spokes and the chain for the bicycle. Another has the straps for the guns. I've included an image of the unpainted figures and you can see where the p.e is used. The back of the box has a ful l painting guide as well as the usual assembly guide for the figures. 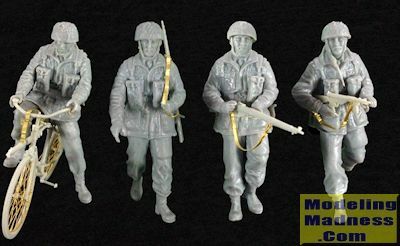 It is a most welcome addition to any figure set and one that should help to make for a more interesting diorama.